You know we have all sorts online these days. But come to think of it. How could anyone trust you not having to ever deal with you before? Moreover, to part with their hard-earned resources, naturally, will be difficult –not even with the economic realities, Nigerians are experiencing today. Now you will need to show. You will need to prove to the client beyond reasonable doubt that the investment is invaluable towards their business success. I guess it’s so glaring that today’s businesses needs a website, don’t they? The reasons are endless abi? 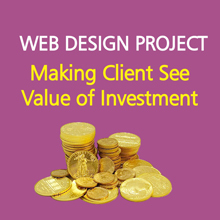 For the web design company, why do you need a financial commitment from the client? Not by Michael Jackson but by me. Getting a financial commitment from your customer is very important but sometimes hard as I declared earlier. You will definitely need the money to pay for domain name and hosting to say the least of cost implications. Additionally, it will help you get some form of motivation for the work – I wouldn’t say money should be your focus, but just a motivation for you and a PROOF of commitment on the part of the customer – striking a win-win position. The other very crucial point you should consider in demanding requesting (common now this is too hard, requesting is better abeg) for advance payment is to ensure the client’s heart is on the job. Where his treasure project is, that’s where his heart will be also. If there is no form of monetary commitment to the project at hand, people seem to quickly lose interest or even forget they have an important project going on. It’s just important to get the client to pay atleast a 50% advance or down payment of the total bill charged for the web design project. In my own personal case, I ensure I get a 75% advance before I kick off. Though there could be some form of exception to for long-standing or existing customers with integrity, they just have to ‘drop something’ to facilitate the project. The Last point I want to throw open here as regards getting financial commitment from the customer is to avoid waste of time and effort. A friend of mine shared his experience with a client that called on him to do an urgent job. Being a time conscious person never wanting to disappoint, he quickly moved to execute the job without any form of advance or financial commitment on the part of the client. After he finished the job, he called on the client much later in the day asking him to come for collection. To his utmost surprise, the client said he had done the job elsewhere. Worse still, the job in question required use of expensive materials. Unfortunately, he had to pay for the job. This was really quite regrettable. There are really quite some very bad scenarios of client defaulting when it comes to getting financial commitment, but it should just be very important, especially at this stage of design, to get advance payment before going ahead with the much crucial part of the web design project. Piecing it all together, it’s important you show the client the importance of getting that website up and running. The reasons proof are endless. 1. TRUST: Great web design instills trust in your business. According to web credibility research from Stanford, 75% of users admit to making judgments about a company’s credibility based on their website’s design. 2. ONLINE VISIBILITY: How many small businesses in Nigeria today can strategise on how to reach majority of its prospective clients with a small budget? Never in the history of man has it ever been so possible to reach more and more interested buyers than through a powerful online business powered with a great website. Print ads are often limited to local demographic ranges, and those print providers who offer international canvassing will usually charge a large premium for long-range distribution. With your professional website, you can target a global audience, and even secure transactions entirely online with buyers around not only in Nigeria but the world. Consider the targeting now available for your online marketing campaigns. Business owners can geographically and demographically target people by setting up campaigns (paid and organic) across multiple online platforms. 3. SAVE MONEY: In addition to the above mentioned point and contrary to the concerns of budget-minded small business owners, investing in a professional website will actually save you money in the long term. Marketing is an intergral part of business success, and the comparative price and cost-effectiveness of a professional website versus a traditional paper listing quickly reveals the value of your online investment. Websites are cheaper, and expose you to a much wider audience than could be accessed through print advertising alone. Moreover, having a cheap website designed on a template can cause huge issues when things need to be changed or updated. Most of these templates are rigid if you need to modify certain elements based on what the analytics are telling you, and are much less adaptive in this regard than a custom professionally-designed website. 4. TAKE OFF HASSLE: Having a presence online via a website helps you remove any form of physical hassle your business location may pose to your intending customer. They have enough information to make their decisions. Customers who are interested in your products and services will have some questions before they commit to their purchase. Whether they need to know pricing, shipping fees, or any other common query, your website gives you an opportunity to list all relevant products/services information, and even provide an opportunity to anticipate and answer customer questions in the familiar “Frequently Asked Questions” sections seen on websites around the world. This means that you can simply direct all queries to your website rather than taking the time to dig up and deliver specific information for an endless stream of client questions. A side benefit of having this content on your website is that it gets picked up by Google and can help in your search traffic generation. In the modern technological era, the internet is the predominant medium used by consumers to search for desired products, services, and companies. More and more in the new year, the user’s experience and behaviour on your website is influencing how well your site performs in search engines. Having a professionally-designed website that works well with search engines will help you distinguish yourself from your competitors. More and more in the new year, the user’s experience and behaviour on your website is influencing how well your site performs in search engines. On the other hand, lacking a website or one of adequate quality will quickly devalue your product in the eyes of your potential customers, and subject you to heavy penalties in the search marketing realm. Your website functions like a live-streaming brochure for your company. Since you can update your content at any time, a website is much more efficient than a print ad, which is permanent and can most likely be discarded if offers or products happen to change. Unlike easily-outdated print ads, your website is live and is an organic entity that is constantly evolving and getting updated for your clients. This means your customers will have reason to check back on your website often, whereas a printed ad is typically glanced at once and then thrown away. Unlike easily-outdated print ads, your website is live and is an organic entity that is constantly evolving and getting updated for your clients. Of course, having a website that was last updated in 2012 does you no good either. Investing in a professional website design provides your company website with the on-going addition of fresh and relevant content that will keep your customers coming back while keeping them engaged with your brand.